What a little beauty! 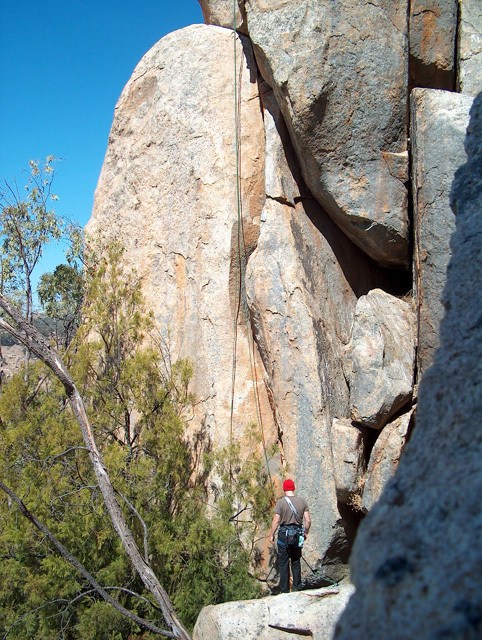 Easy access, nice views and some fun, challenging routes with just enough height to get a workout, but not too tall so as to make top roping tricky. The gentle whinnying of the horses in the paddocks below, the graceful eagles circling above and the wide, open views give the place a certain atmosphere. Okay, there's not many climbs, and yep they only go up to grade 21, but there are several routes here without stars in the guide that are, in my opinion, deserving of attention if not out and out glee at least with the rope above you. 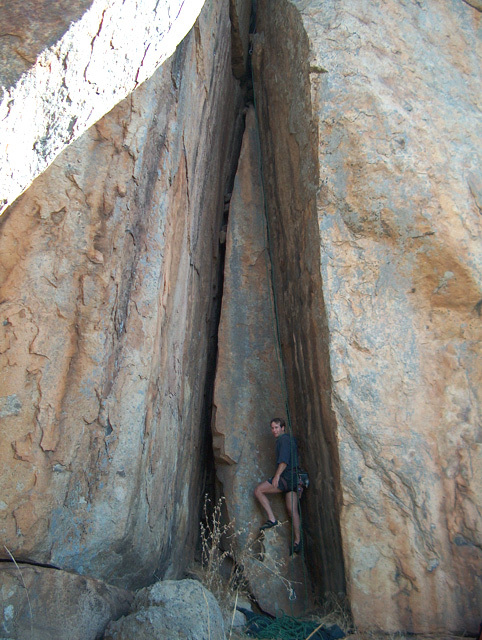 For starters the place is taller than you'd expect from a roadside crag. Then you've got diversity of moves; lots of lay backs and jams and a sprinkling of face/slab routes. And due to the tight grained rock, they are solid jams that don't eat your flesh (despite names like "sandpaper crack"), so jam-phobics need not run in fear. Basically, this is a recommended day trip destination for those people happy to muck about on 15 to 21 grades, with a couple of beginner routes to satisfy newcomers to the sport. Nothing to do for non-climbers though, so probably not SO friendly. From Melbourne shoot up the Hume by-passing Seymour and heading towards Euroa. 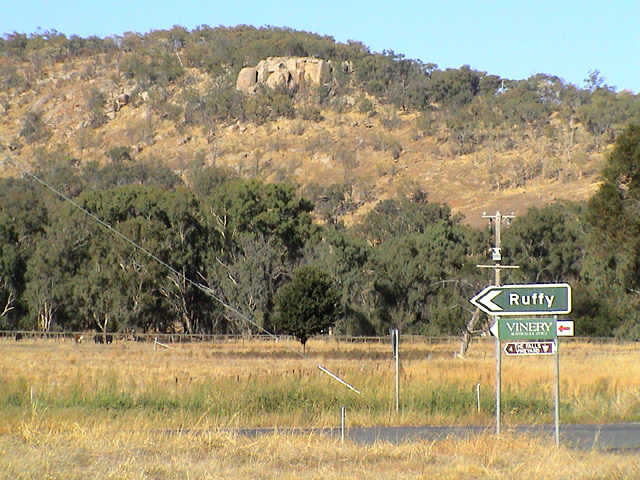 About 4km past the Oak Valley Road turn off to Teneriffe, you'll spot another right, this time for "Ruffy Road", just over Tubbs Hill. Take this right for a short distance to a T-intersection, then go right again. As you drive up you'll get the view pictured above. Keep going up onto the ridge (past the "no through road sign"), until just before the bitumen disappears. Park here. You'll find a gate and a farmer's 4-wheel drive track leading up the hill on your left. Follow it steely up for 10 minutes and it will take you to within 20m of outcrop (circled in red). Note: you are on private land and need to ask permission. Happy for climbers to access Big Hill via crossing the property which is a horse stud and training facility. If going to Big Hill to climb, please contact beforehand to let him know. They have had issues previously with 4wd vehicles driving onto property and also shooting. Kangaroos and wallabies have been shot and left to die with some making down to the property. Because of this, the gate has now been locked so that vehicles can't get on. If climbers see anything like this happening or untoward, please also give Craig a call – he said it would be much appreciated. NOTE: He said there have been a huge increase in the amount of snakes that have been seen – lots of browns. So take care. Falcons nest there in September through to about November so don't access then either." The climbs indicated on the topo shot above are recommended, and easy to set up as top topes. Cutthroat Crack will likely be the first route you'll see assuming you've approached from the 4-wheel drive track. Getting off most routes is simply a case of scrambling / walking back down. 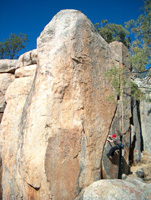 Above Left: Brad boulders the flake start to Cutthroat Crack (19). 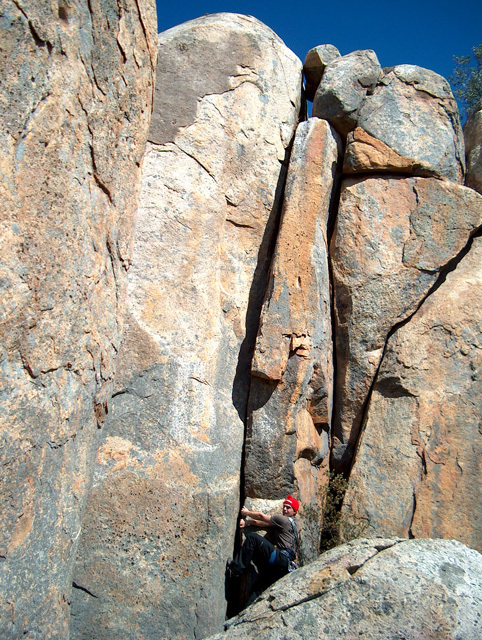 Above Right: Michael investigates the solid jam crack start of Tribulation (15). This is a little ripper and an easy tick for the grade. The razor sharp flake start may not protect too well on lead, but there is a great stance just above it, then a tips only lackback that looks daunting from below, but is over in about three moves. Short and sweet. The tagged and bolted face route to the left of this looks interesting, but hard. To the right there is a little 8m grade 10 that looks nice for beginners. Harder than it looks, but very enjoyable and in the shade most of the day! The wide crack on the left is supposed to be 14, but would be very hard to protect and is slippery as a layback. The jam crack on the right (which can be laid back too) is much more solid. Some of the best jamming I've found, and it takes a lot for me to say I like jamming. Way more protectable too. The route, however, is marred by an ugly squeeze chimney top out, beneath a chockstone. We avoided this nastiness by lowering from below it. I'd consider this route hard for the grade. Above Left & Middle: Dipsomania (19) starts under the tree. 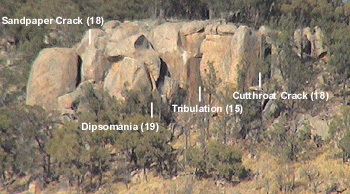 Above Right: Sandpaper Crack (18) found on the secondary tier at the far left of the crag. Again, hard for the grade, the crux being a thrash-fest at a bugle in the middle where-in very small crimps on the right can be used and a tips only seam on the left, with poor feet. A workout indeed. However, it does have a hands free rest stance above it, and a good stance below it, so as cruxes go it could be worse. Harder than 19, I'd accept 20 or even 21. The rest of the route though is nice, varied climbing, with a slab top out protected (as at time of writing this) only by a single rusty carrot sticking out way too far. The summit contains two bolt shafts with threads but not nuts, so you'll need a length of static rope to lasso some of the blocks below to set an anchor on the top. An accurate grade and a fun route, worth a star. 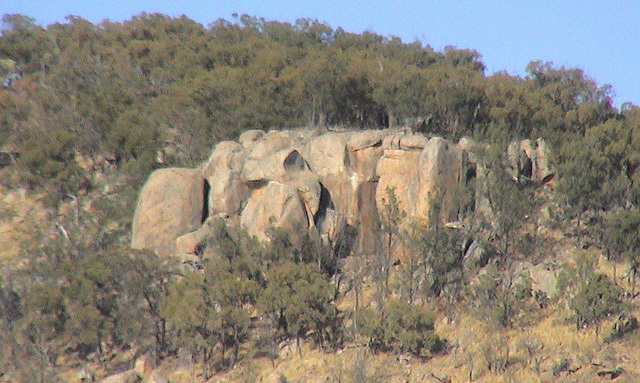 You need to circle around the outcrop to find this secondary tier above. Lackback start leads to a good stance, then solid jams in the middle thinning as you go up, but there is a jug on right face just when it starts getting tricky. 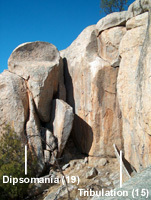 Some loose rocks mar the top out, but can be avoided. Haul over the chockstone to finish. Very nice! Lost for Words (21) to the right of this also looks good.